Our Metal Money Slot Covers are available with Steel or Brass Finishes, and our Lucite Money Slot Covers come in clear, red, and black. 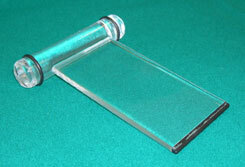 Clear Lucite Money Paddles are also available. Our money paddles are Lucite with rubber-tipped blades and "O" rings. 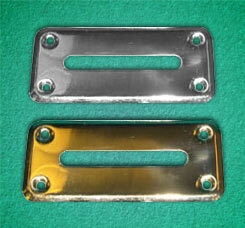 These money slot covers are available with a stainless steel or brass finish. Brass Sale Price: $3.91. Was $5.95. Save 34%. Steel Sale Price: $2.69. Was $4.95. Save 46%!. Please Note: Red is no longer available. Feel free to browse our selection of Blackjack Accessories, Insert Trays, and Drink Holders. 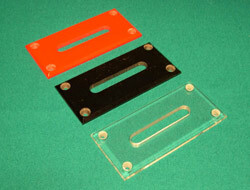 For more information on our Money Slot Covers and Paddles, please contact us at 1-800-233-0828.